The most exciting aspects of Gary Coyle’s practice are arguably his performative, photographic and sculptural work, as these forms often best highlight his skill for being present in the work (as the witty sarcastic storyteller in the lecture- performances from his 2010 exhibition At Sea in the Royal Hibernian Academy) while also representing a sense of physical absence (in his found object installations and his barren seascape photography). Coyle’s latest exhibition Into The Woods, which is installed in the Ashford Gallery of the RHA, offers a new series of large charcoal drawings on paper which forego the concrete physicality for something altogether more speculative. 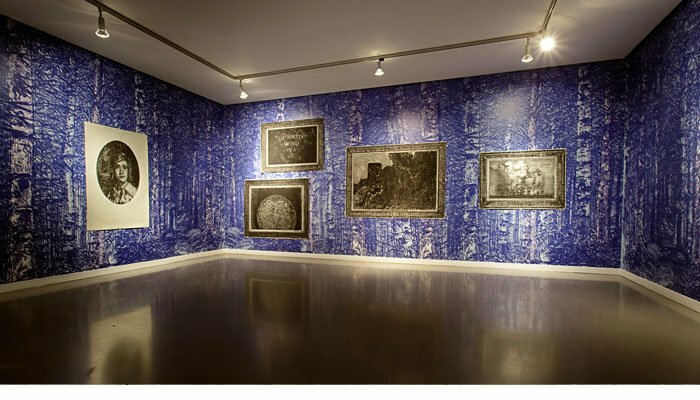 The RHA’s Ashford gallery is a slight space; Coyle embraces this with a large wallpaper installation that encompasses its four walls with a distorted rendering of claustrophobic hyper-boreal woodland drawn in a jagged etched style , landing somewhere between illustration and repeat pattern. The first of the hung drawings, Curtain, introduces the running motif in the show of drawn ornamental frames at the page’s borders. This murky quality of the charcoal on the page lends the feel of early photography to this depiction of a curtain. The tense uneasy atmosphere of the drawing recalls David Lynch’s style of projecting the banal through a magic realist lens. Coyle’s style of charcoal drawing changes throughout the show. The blurred foggy smudges in Curtain are replaced by strong defined gestural lines in Ingénue, a semi abstract drawing of what appears to be a cat’s head. One of the stronger images in the show, Gregory, combines these two forms of charcoal mark making to produce a haunting portrait of an androgynous young boy in front of an idyllic nature scene. His hairstyle & outfit are from a different era; like an image from a missing person’s notice, his lost, muddy eyes stare out at the viewer forebodingly. While the foreground image of the boy appears in the blurred photographic style of curtain, the composition of the work, with its oval border & the uncertain perspective of the image’s background scene, suggests pre-renaissance painting. The combination of the 1970’s fashion with 1370’s composition would seem playful if not for the grimness the image implies. A hand clutching a smart phone protrudes into the frame of Dreaming Different Dreams, hung in the centre of the far wall. The smart phones camera function is shown pointing at some unclear forest atrocity that consumes the majority of the composition. Smoke bellows out of the gorgeous charcoal haze of Coyle’s ambiguously drawn foliage. The drawings title suggests something otherworldly, but the act of recording disasters is very much ingrained into our contemporary society. Dreaming Different Dreams attempts to posit itself in the uncomfortable position between the vapid normality of daily smart phone usage and the fiercely con-founding reality of disaster. Another shrouded catastrophe appears in 27/7/1979 The Death Of Disco. Bringing Coyle’s attentive drawing style to the fore, the filmic quality of the smoke plumes emerging from the scene’s flat expanse recall the grainy hum of Coyle’s photographic series Lovely water. 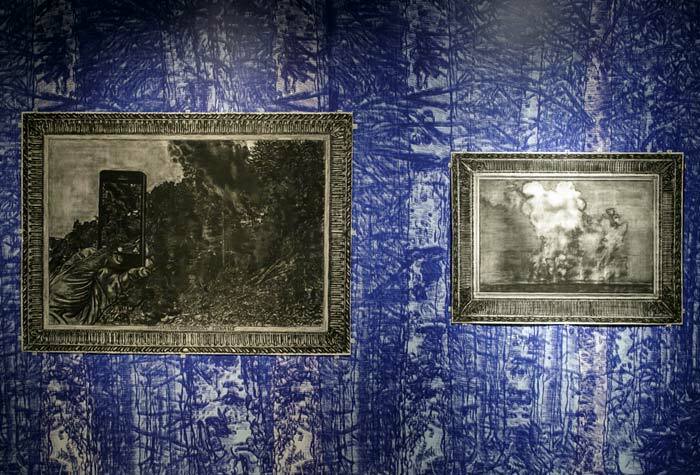 Into the woods is a competently conceived exhibition containing some wonderfully realised charcoal drawings. Although it manages to overcome the restrictions of its installation space, it is lacking in the ambition which has made Coyle’s previous projects so memorable. 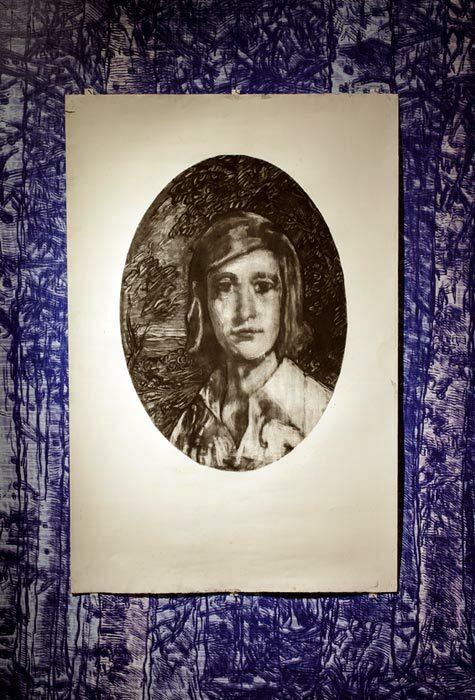 His decision to question contemporary image culture through drawing rather than a lens-based means is understandable, and, although Coyle has a truly rare and acute ability with charcoal, his biggest strengths simply are not on full display in the show.